Body Details specializes in utilizing True Laser® technology for hair removal, tattoo removal, and remedying skin imperfections. In order to stand out from the rest of their Florida-based competitors, the company needed to leverage effective, proven marketing tactics. Reaching their target audience in a calculated and pointed manner was most important for Body Details. They placed great emphasis on the consumer journey and wanted to ensure that they connected to potential customers with content specifically designed for each stage of the customer decision process. As a result, Body Details needed a diverse content strategy that included social media to create awareness, blog posts to boost engagement, and email newsletters to retain customers. Tapping into their vast network of writers that understood the beauty and skincare industries, ContentWriters was able to perfectly match writers to Body Details’ unique content needs. The result? 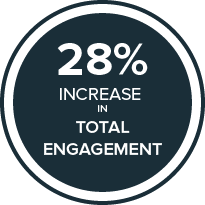 28% increases in total engagement in key metrics such as website traffic, social shares, and open rates. In a such a competitive industry, even the slightest increases in engagement can have large ramifications. Double digit increases in engagement, however, cannot be overstated.